For 25 years this has been a classic among toolboxes world-wide. 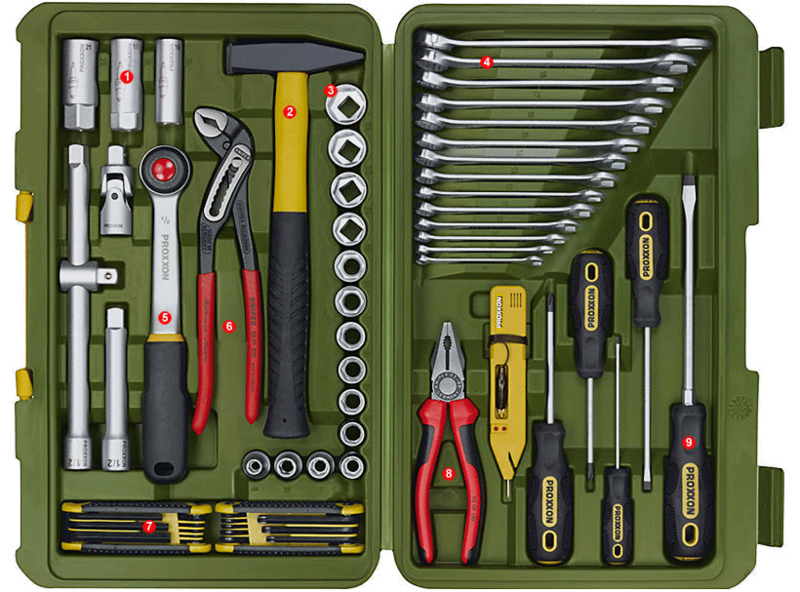 Featuring first class assembly tools. The selection of 16 and 21 mm spark plug sockets was enlarged joining size 18 mm, which has become increasingly important. Ball-peen hammer (300g), with graphite handle for superior vibration damping, handy non-slip grip. 1/2" sockets: Now 14 instead of 10 sockets (11, 16, 18 and 21mm have been added). SlimLine combination spanners from 6 - 19mm. Now 14 instead of 12 spanners (with sizes 16 and 18, new as per ISO for screws M 10 and M 12). Reversible ratchet with release mechanism, made from a single steel billet. Knipex water pump pliers with through-lock system. 8-piece pocket Allen key (HX 1.5 - 8.0mm) and TX key (TX 9 - 40) sets. High quality combination pliers of CrV steel. The FLEX-DOT screwdriver set now includes also PH 1 while we have given up on the two carburettor (stubby) screwdrivers - apologies to classic car fans. 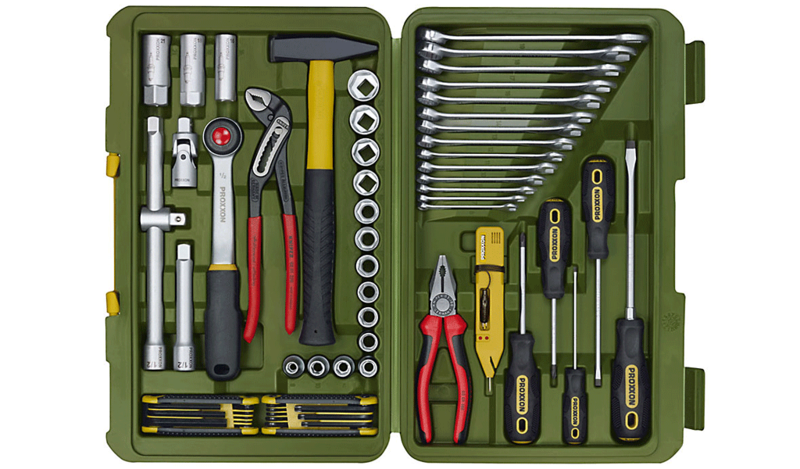 Automotive and universal tool set. Now in its 7th generation. Each tool has its proper place - organized forever! Reversible ratchet with release mechanism. Knipex water pump pliers with box joint. Knipex high quality combination pliers of CrV steel. FLEX-DOT flat-bladed screwdrivers in sizes 3 - 5.5 and 8mm. Phillips (PH) screwdrivers in sizes 1 and 2. PROXXON design by Helmut Scholz: A high-quality POLYPROPYLENE tool case without frills. Treadable, shock-proof, fuel and acid resistant.